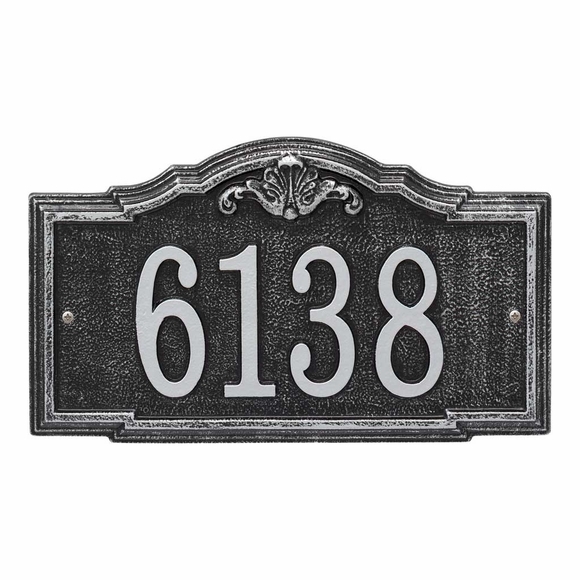 Gatewood 1 Line Address Plaque with House Number - - includes the address number your supply and a simulated carved wood accent. Traditional styling. 15.75x10 plaque available for wall mount or lawn mount. Made in USA. Address line holds up to five (5) 4" characters. Address, accent, and border are permanently cast into the sign. Alumi-Shield™ All Weather Coating protects against the harshest weather and environmental elements. Extends the sign's life and appearance. BS black with silver characters (shown in large image). Small images from left to right: AC antique copper; BG black with gold characters; BV bronze verde; OB oil rubbed bronze; OG bronze with gold characters; and PS pewter with silver characters. Dimensions: 15.75"W x 10"H x 0.4". To purchase the two-line version of this sign, click top link in Related Products.